Driving to Lancaster County is the most practical way to come to Pennsylvania Dutch Country. Since it is very likely that you will wish to town-hop during your stay, it is helpful to have a vehicle at your disposal. Nevertheless, it is also easy to arrive by Bus, Train, or Airplane. Once here, you may wish to rent a car, if you don't already have access to one. However, you can also get around via public transportation, tour bus, or better yet, by bicycle. If you live in Pennsylvania, New York, New Jersey, Delaware, Virgina or Ohio, driving to Lancaster County will not be a problem. Since Lancaster County is so centrally located, it is in close proximity to many major cities and historical sites such as Gettysburg. Furthermore, because the area surrounding Lancaster County is predominately rural, your drive will also prove to be quite breathtaking as you pass lush farmland and green rolling hills. Since there are so many hidden little back roads, you are free to explore the region at your leisure and discover places off the beaten track. From Philadelphia: Take Route 30 West into Lancaster County. Likewise you can follow the Schuylkill Expressway (Interstate 76 West) to the Pennsylvania Turnpike (also Interstate 76 West)to Exit 286. Then, take Route 222 South to Route 30 into Lancaster County. Philadelphia is approximately 65 miles from Lancaster County and will take you between 1 and 1-1/2 hours. From Baltimore: Take Interstate 83 North to Route 30 East into Lancaster County. Baltimore is about 75 miles away from Lancaster County. It is likely to take you about 1-1/2 hours. From Central New Jersey: If you are coming from the vicinity of Trenton, simply take Interstate 95 South to the Pennsylvania Turnpike (Interstate 76 West) to Exit 286. Then take Route 222 South to Route 30 East into Lancaster County. Depending on where you are coming from, the distance is approximately 100 miles and the drive could take you about 2 hours. From Brooklyn and Staten Island: Take Interstate 278 West to Interstate 95 North. Then, take Interstate 78 West to Exit 13. From there, take Route 501 South into Lancaster County. The distance is about 150-155 miles and traveling time is about 3 to 3-1/2 hours depending upon traffic. From Manhattan: If you are planning on driving to Lancaster County from Manhattan, simply take the Holland Tunnel to Interstate 78 West to Exit 13. Then, take Route 501 South into Lancaster County. The approximate distance is 150 miles. The drive should take you about 3 to 3-1/2 hours depending on traffic. From Richmond: Take Interstate 95/495 (DC Beltway) North to Interstate 695 (Baltimore Beltway). Go West on Interstate 695 to Interstate 83 North to Exit 21. Then, take Route 30 East to Lancaster County. It is about a 230-mile trip that will take you approximately 4 hours to arrive. Boston If you are coming from Boston or the general New England region, you will need to take the Massachusetts Turnpike (Interstate 90 West) to Interstate 84 West to Scranton, PA. Then take Interstate 81 South to Exit 104. Finally, take Route 501 South to Lancaster County. It is about a 360+ mile drive depending upon your initial departure city. The ride is approximately 7 hours. However, if you are driving with small kids, you might be making some bathroom stops as well as snack brakes. This, of course, will add to your driving time. From Cleveland: Take Interstate 80 East to Interstate 76 West, which becomes the Pennsylvania Turnpike; take Exit 286. From there, you will take Route 222 South until you reach Route 30 East which will lead you into Lancaster County. Driving to Lancaster County from Cleveland is approximately 365 miles and will you take you at least 7 hours. Once again be prepared to make routine bathroom and snack breaks, especially if traveling with young ones. Fortunately, there are a lot of nice places to stop along the way. As you can see, driving to Lancaster County is really not very difficult. 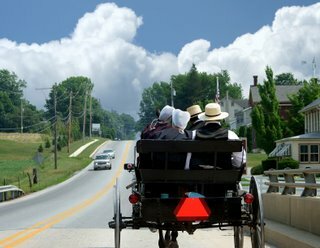 Depending upon you starting point, Pennsylvania Dutch Country makes for a very convenient day trip, weekend excursion, or extended vacation.